Logging / resource extraction companies. Do you want to be trained or train your employees to be safer, smoother, more efficient, have a greater skill set, reduce damage to your equipment and vehicles? Then these courses are for you. 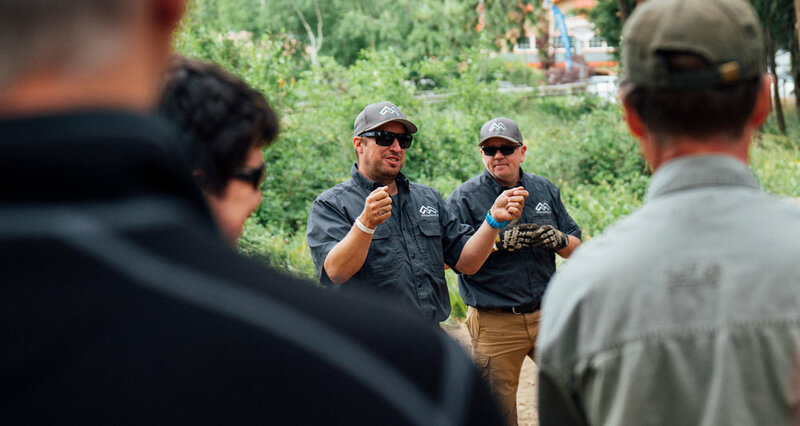 We offer qualifications from two organizations; the BC Forest Safety Council and the City & Guilds. Both offer unique opportunities to a variety of user groups. Both of which include commercial qualifications and qualifications suitable for recreational users. Our driving courses are aimed to cover all aspects of off road driving in a commercial and non commercial environment. Each course has unique modules allowing you to choose which course is best suited to your needs. We are the ONLY certified company able to offer the City & Guilds training & assessments in Canada. We have staff that are instrumental in the development of the BC Forest Safe Council Resource Road Light Truck Driver Training course and that are the leaders in the delivery of this course. IMPORTANT: The courses that we offer not just for forest workers but for individuals and companies who travel on resource & forest service roads. For more information on the British Columbia Forest Safety Council please follow this link. The City & Guilds works with education providers, employers and governments in over 100 countries across the world to help people, businesses and economies grow by shaping skills systems and supporting skills development. The City & Guilds Group is made up of City & Guilds, ILM, Kineo, The Oxford Group, Digitalme and Gen2. Together, they set the standard for professional and technical education and corporate learning and development around the world. The products and services they offer across the Group are globally recognised and respected. For more information on the City & Guilds please follow this link. ** Venue and travel fees may apply. Please contact us for more information. Resource Road - A resource road is a road that is built specifically to travel away from a paved road to access resources such as mines, logging zones, hydro lines, pipelines etc. The surface is often gravel based and presents unique challenges as seasons change. These roads are often somewhat maintained, possess very few safety features and are inherently more dangerous and remote. Off Road - Any trail, track, route that is a none maintained surface, often with no construction to it at all. Uses natural terrain and can encompass a variety of surfaces from sand, mud, ruts, rock, shale, gravel, grass, water and so on. 4 x 4 - Any vehicle that has the ability to power or drive each it's four wheels (or more on dual axle vehicles) to give the vehicle potentially more traction. Used by a wide array of users be it from SUV's to light pick up trucks.